BLOCKMATES are forever, they say. I'm extremely grateful for the rare chance of meeting Lennie Chua-De Castillo (who just recently got married) and Carlo de Guzman over dinner. Carlos Cuano, among my dearest friends in IM, was there, too. We used to be part of the H1N1 research group in first year med school. We were together in small group discussions and group presentations that required some degree of shamelessness. 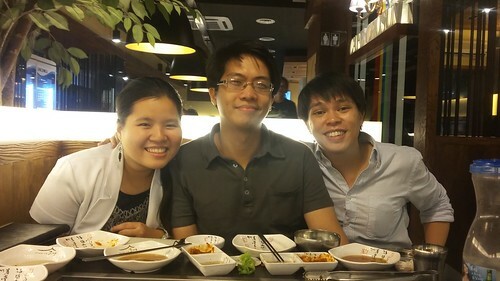 We had Korean food for dinner and had a lot of laughter. We talked of blockmates we haven't seen in a very long time. Those were the good ol' days—med school, that is—when life was so much simpler. Tonight, though, I realized that we haven't really changed—except that Carlo now wears eyeglasses and Lennie (or "Wet," as I fondly call her, for reasons too long to elaborate) now carries a handbag everywhere. I still bump into her once in a while—she's stationed at the Pay Floors, too, and she's my number one go-to person when I need to consult about stroke and other matters of the brain. I handed Lennie my share of the bill. She asked me how much my change was, laughing, knowing that I cannot, for the love of me, mentally manipulate numbers without pen and paper.